Thank you for your gifts and your prayers on our behalf. This month, we especially pray for the many members of the KNOM family, relatives and other loved ones, who are serving our country in the Middle East. For these, and for all, we pray for safety and protection. �HERE! HERE!� (left) That�s KNOM volunteer Emily Barrett, who has joined Amy Flaherty and Julia Dunlap in signing up for a second year. 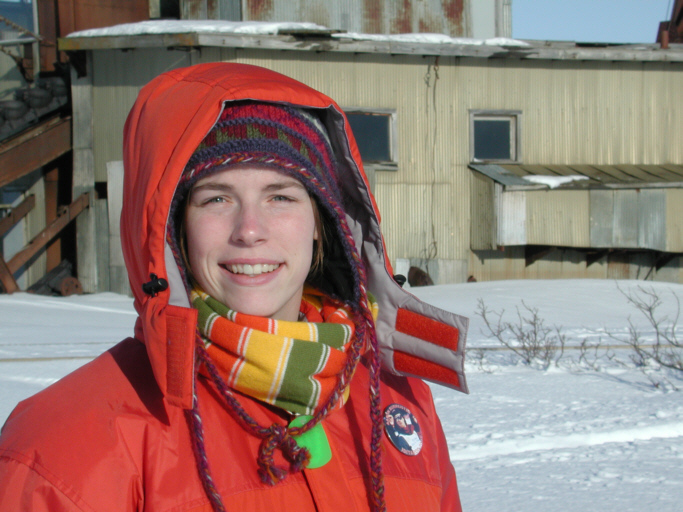 Among other duties, Emily has been preserving traditional Eskimo songs in digital stereo. Emily�s 26-year-old brother is among our servicemen being sent to Kuwait. Please especially remember him in your prayers, won�t you? In June and July, we look forward to greeting Amanda Dummer from Lansing, MI, and Clinton White from Florence, AL. We�ve accepted these excellent young people as volunteers for next year. WHAT A CARD: Several of our friends who are contributing automatically by credit card have asked us to not send a coupon. However, our most inexpensive way of mailing the �Nome Static� is to send out every piece of mail identically, including our coupon. If you�re one of these good folks, we hope that you might find another small use for the card, perhaps as scrap paper, or for a shopping list. Better yet, you can give it to a friend! The oldest Catholic radio station in the United States, KNOM beams the Mass and Rosary, and thousands of hours of inspiration and education, with news, information and positive companionship throughout western Alaska, 24 hours a day, thanks to you. INSPIRATIONAL SPOT: Question: Do I fully trust that with God at my side, I will find my true home? top REPEAT, PLEASE? As you may have read, we�ve been lobbying the Federal Communications Commission to allow us to apply for translators, low-power transmitters that will repeat the KNOM signal in the villages of Shishmaref and Kaltag. The federal application process has been frozen for several years. · Shishmaref (SHISH-mah-reff): Electrical interference has blocked the village�s 589 Inupiat Eskimos from hearing KNOM. On a barrier island that is eroding, they especially depend upon KNOM�s weather forecasts. This village, which desperately wants to hear KNOM, is primarily Lutheran. · Aniak (ANN-ee-ak): On the Kuskokwim (KUSS-kuh-kwim) River, this largely Catholic village of 539 Yup�ik Eskimo and Athabascan Indians has been able to pick up KNOM only on rare occasions. · St. Marys (549): Surrounding a Catholic mission founded in 1949, this Yup�ik Eskimo village is on the south side of a hill which blocks and weakens the KNOM signal for many homes. 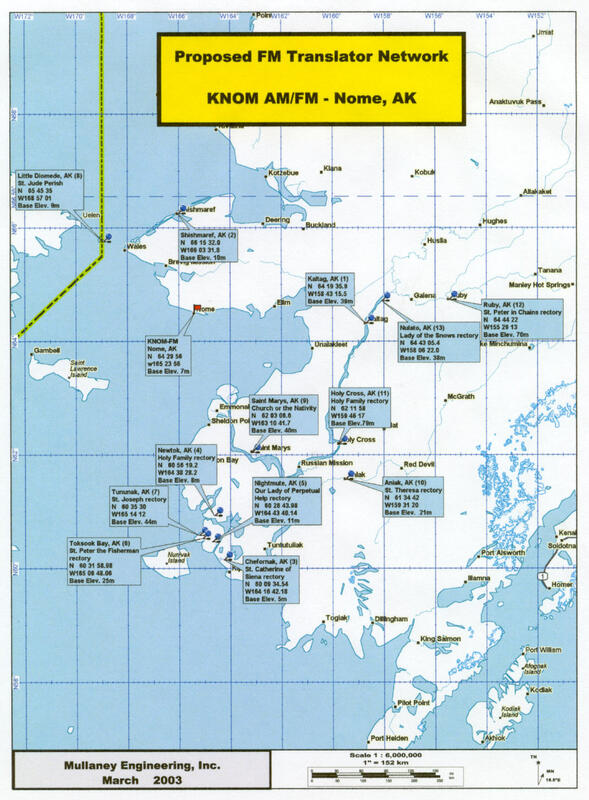 · Tununak (tuh-NOO-nuk) (323), Toksook Bay (TOOK-suk) (549), Nightmute (NIGHT-myoot) (224), Newtok (NEW-tahk) (326) and Chefornak (Cheh-FOR-nuk) (419) are Catholic, extremely traditional Yup�ik Eskimo villages which easily heard KNOM in the days before electricity. Today, a few souls are able to pick up the station, but for most, it�s drowned out by static. · Little Diomede (DYE-uh-meed) (128): A Catholic village of Inupiat Eskimos, this is the most rugged and remote village in Alaska, located at the base of a mountain which juts out of the Bering Strait alongside the International Date Line. The village is only 140 miles from Nome, but the mountain blocks our signal, rendering it very weak. Approval may take a year for this project, which represents a huge positive step for our mission. (Left): In autumn 2001, Fr. 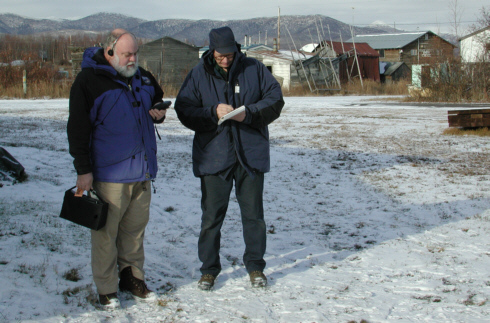 Joseph Hemmer, OFM records a Global Positioning System reading taken by KNOM engineer Les Brown. They stand alongside St. Theresa Parish, where a future KNOM translator will be built in the village of Kaltag. It was Father Hemmer, Kaltag�s pastor, who started us thinking about building repeaters where we cannot be well heard. For more information and photos of a visit to Kaltag, see Nome Static Transmission 429. For more information and photos of a visit to Shishmaref, see Nome Static Transmission 431. Please consider adding missions like KNOM to your will. This final gift can make a huge difference. INSPIRATIONAL SPOT: Every person is on a cross. Some ask to be taken down, like the thief at the left. Some ask to be taken up, like the thief on the right. INSPIRATIONAL SPOT: Let us not look back in anger, or forward in fear, but around in awe. INSPIRATIONAL SPOT: Death is not a period, but a comma. top TO THE CORE: As you know, fresh fruit and vegetables are very expensive in Nome due to the cost of shipping to this remote outpost. The other day, KNOM business manager Florence Busch noted that apples were on sale and bought one. The single apple cost 79¢. Florence took very good care of that apple! NOT POST HASTE: A Christmas present, sent Priority Mail from Nome December 23rd, finally reached its destination, a post office box in Los Angeles, on February 19th. 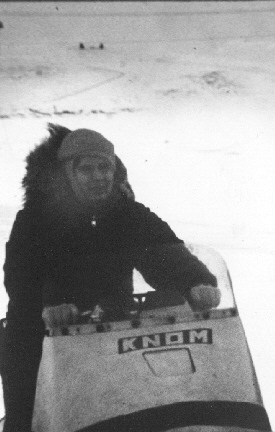 THIRTY YEARS AGO: March 1973: Volunteers Tom Busch and Joe Miller developed hypothermia while covering the first 800-mile snowmobile race from Nenana (nee-NANN-ah, a town south of Fairbanks) to Nome. It was �40° F. Sent on second-hand snowmobiles to watch for racers from a little hill about 4 miles from town, they discovered that coffee from their thermos, boiling when they left town, froze when it hit their plastic cups. Not feeling well, they returned to town before the racers showed up. Tom measured his temperature as 92.5°, which was close to life-threatening, he later learned. It was a valuable lesson for the entire crew. That month, KNOM went all out to cover the first 1,000-mile Iditarod Trail Sled Dog Race. For the race, the Associated Press provided KNOM with a paper tape-punching ticker machine; the station fed reports directly to the AP teletype line. KNOM�s live finish line coverage, fed to KYAK in Anchorage, was the first Nome broadcast to be heard in Alaska�s largest city. (left) Volunteer Peter Van Nort helps cover the 1973 Iditarod race. The snowmobile he�s riding was a $10 junker, rebuilt by the volunteer crew. PLEDGE: When we discussed the topic early this month, 100% of KNOM callers supported keeping the words �under God� in the Pledge of Allegiance. Among other recent topics on the air were Alaska Native tribal sovereignty, the importance of childhood immunizations, improvements in fire fighting, village battles against illegal drugs, and a local campaign that intends to stop people providing alcohol to minors. Thank you for making these programs possible! THANK YOU once again for your prayers and for your financial help, both of which keep our mission strong. As you know, individual contributions by good people like you provide 94% of our day-to-day income. Our signal reaches into dozens of remote villages, and we hope you are as excited as we are that within a year or two, we will beam into a baker�s dozen more. Every week, we open our staff meeting with a prayer on your behalf, and the KNOM staff keep you and your intentions in their own prayers, too. God bless you for your kindness!